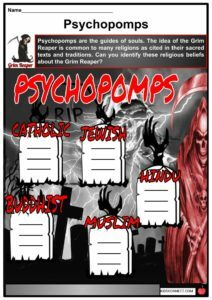 A Grim Reaper, in many cultures, is the personification of death. A Grim Reaper, in many cultures, is the personification of death. Despite its century old belief, a grim reaper is always depicted with a skeletal face hidden in a large black cloak holding a scythe. 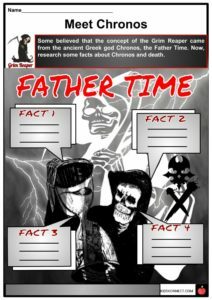 See the fact file below for more information on the Grim Reaper or alternatively, you can download our 22-page Grim Reaper worksheet pack to utilise within the classroom or home environment. In ancient Greek mythology and religion, the bearded and winged young man Thanatos, the god of death, accompanied the souls of the departed to the underworld. In Norse mythology, Valkyries served as Odin’s messengers and escorts of a warrior’s soul who died in battle. They transported the soul to Odin’s Hall where they will be warriors in the afterlife to fight in the battle of Ragnarok. In Judaism and Christianity, archangels Michael and Gabriel are among the known Angels of Death. They are known for carrying messages to mortals. 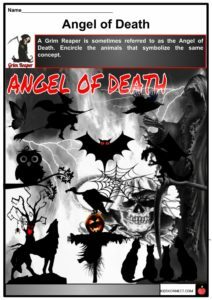 The Islamic Angel of Death, Azrael, is depicted recording a ledger of every soul in the world. In Hindu texts, Yama is the god of death who rides on a black buffalo carrying a rope of souls. In Chinese mythology, Yanluo is the god of the underworld or hell. 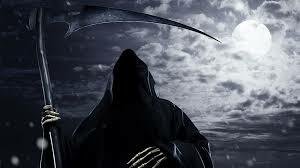 It is believed that the concept of the Grim Reaper began to proliferate in the 14th century in Europe. It was the time when the Black Death caused by a pandemic plague killed 30-60% of Europe’s population. In the Bible’s Revelation 6:1-8, four horsemen namely Pestilence, War, Famine, and Death appear in calamities signaling the end of the world. Since the Middle Ages, a Grim Reaper is personified in skeletal form just like the human body after it has decayed. It is mostly depicted wearing a black robe with a hood, which is probably adapted from funeral services of various religions. Moreover, a Grim Reaper holds a scythe, an image taken from agricultural practices of harvesting. A scythe is a mowing tool with a long handle and curved blade. In some cultures, a Grim Reaper also holds an hourglass which denotes the person’s remaining time on earth. In some beliefs, a grim reaper can cause someone’s death by appearing in dreams while the sleeper’s body is not able to move and soon dies of a heart attack. 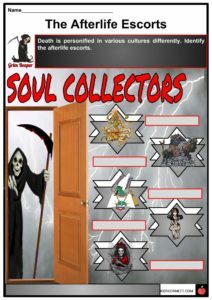 Some Grim Reapers are depicted as guides of the dead towards their journey to the next world. 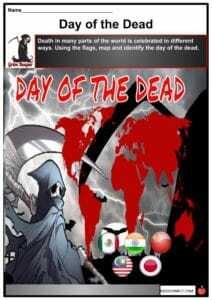 A Grim Reaper is known to possess supernatural abilities including the power to manipulate events ensuring the death of the chosen being, teleportation of people and things, to heal wounds and illnesses, and kill a living person with a single touch. Grim Reaper is among the popular characters depicted every Halloween. Henry Wadsworth Longfellow even composed a poem on how Rabbi Ben Levi tricked and escaped death. The Danse Macabre or Dance of Death is a play set in the wake of the Black Death in Europe. It prepares churchgoers for the inevitability of death by dramatizing a meeting with Death in a cemetery. In 1957, the film The Seventh Seal was about a story of a knight who returned home after the Crusades only to find out that his countrymen were plagued. 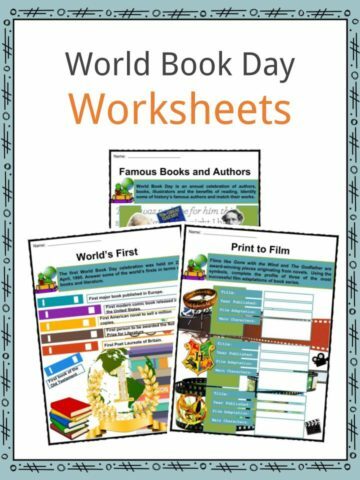 Emily Dickinson wrote Because I could stop for Death in which the narrator shared a carriage ride with Death. In Charles Dickens’ A Christmas Carol, Death showed how Scrooge will die. In Neil Gaiman’s The Sandman, Death appears as a girl. In 1998, Brad Pitt played Death in the film Meet Joe Black in which the character experiences the life of a mortal. 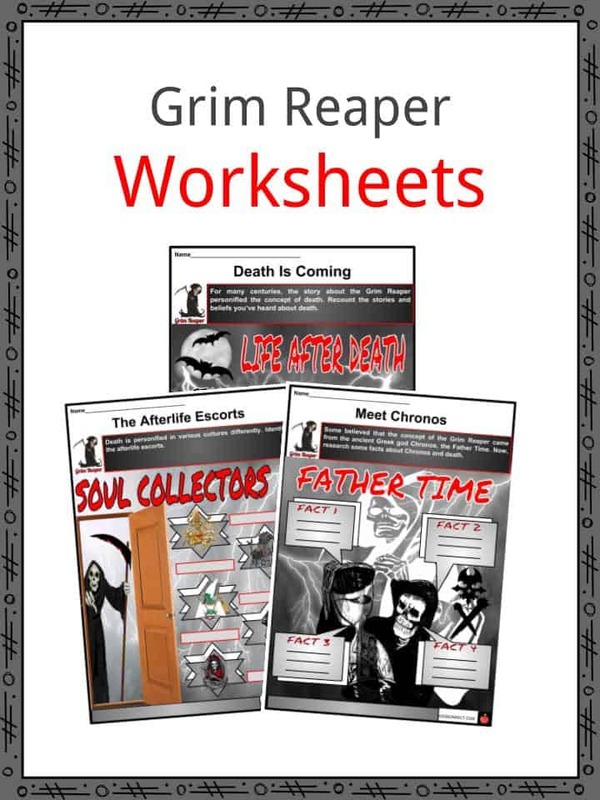 This is a fantastic bundle which includes everything you need to know about Grim Reaper across 22 in-depth pages. 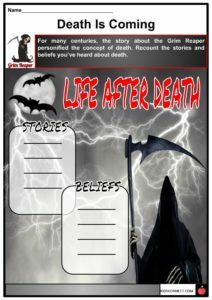 These are ready-to-use Grim Reaper worksheets that are perfect for teaching students about a Grim Reaper, in many cultures, which is the personification of death. Despite its century old belief, a grim reaper is always depicted with a skeletal face hidden in a large black cloak holding a scythe.